City of Alhambra's New Year's Day parade float to highlight Nisei veterans of WWII. Rendering of the City of Alhambra’s Rose Parade float, based on the Go For Broke Monument in Little Tokyo. 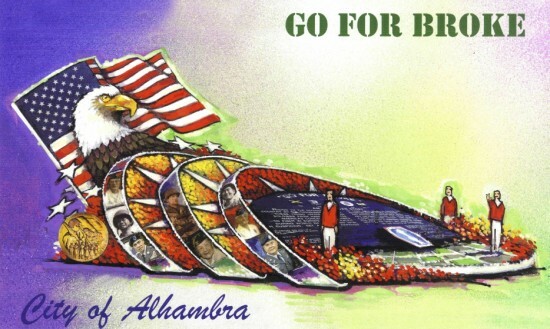 ALHAMBRA — “Inspiring Stories” — the theme of the 126th Tournament of Roses Parade in 2015 – is just what the City of Alhambra is focusing on as it enters its 87th float entry into the Tournament of Roses Parade, to be held this coming Jan. 1 in Pasadena. And there’s no better or more inspiring narrative than the life stories of the “Go For Broke” Japanese American soldiers who served in segregated units during World War II, answering their country’s call to arms with unparalleled bravery. Many of the soldiers came from sugar plantations in Hawaii, where their immigrant parents were denied citizenship and treated as second-class citizens. Others volunteered from internment camps that imprisoned 120,000 ethnic Japanese after the bombing of Pearl Harbor. To this day, the service record of the “Go For Broke” soldiers is unmatched: the 100th Infantry Battalion and 442nd Regimental Combat Team are the most highly decorated units by size and length of service in the history of the U.S. Army. The Military Intelligence Service has been credited with shortening the war in the Pacific by as much as two years, and saving countless lives. In November 2011, these three units were awarded the Congressional Gold Medal, which, along with the Presidential Medal of Freedom, are the country’s highest civilian honors. The stories of these soldiers became the inspiration for the theme of the city’s 2015 Tournament of Roses float. Thanks to Go For Broke National Education Center, which is partnering with the city on this project, the design will feature a motif resembling the “Go For Broke” monument that is located in Little Tokyo. Dedicated in 1999, it was designed by Los Angeles architect Roger M. Yanagita, and features a large semicircular face of polished black granite, set at an angle facing the sun as it travels across the southern sky. The monument is engraved with the names of over 16,000 Japanese American soldiers who served in World War II. The Alhambra float is being designed, built and decorated by a well-known float designer/builder, Phoenix Decorating Company. It will feature not one but three semicircular faces with the main one bearing a striking resemblance to the Go For Broke monument in Los Angeles — but using all natural plant elements in stunning and intricate detail. Along the edges of each semicircular face there will be depictions of the 21 Japanese Americans who received the Medal of Honor for valor during World War II. At the rear of the float there will be a large American flag and eagle’s head. A likeness of the Congressional Gold Medal will be incorporated into each side of the colorful float. The float riders will include several surviving “Go For Broke” veterans. To help promote the inspiring stories of the Nisei soldiers, the City of Alhambra Civic Center Library, in partnership with Go For Broke National Education Center and Alhambra American Legion Post 139, are planning a wide range of events this fall with the theme of “War Comes Home,” which is centered on reading and discussion of the book “What It Is Like to Go to War” by Karl Marlentes. The program kicked off on Sept. 16 with a documentary featuring “Unknown Warriors of World War II” (a historical account of the Japanese American combat units in World War II), and the film “Go for Broke!”(in which Japanese American soldiers of the 442nd fight valiantly for the Allies, despite racial discrimination). Whether you see the Tournament of Roses Parade in person or on TV, be sure to look out for Alhambra’s “Go For Broke” float, and also check out the corresponding library programs that will give the community greater insight into the incredible life stories and bravery of these soldiers. For even more inspiring stories, listen to hundreds of oral interviews conducted by GFBNEC at www.goforbroke.org.